Admittedly, this book took me awhile to complete. I rather slogged my way through it. I think it was a combination of the content feeling a bit dry at times and my maternity weariness which causes me to want to fall into a deep slumber when I put the boys down for their afternoon naps. It is not that the subject matter itself wasn't interesting to me. I was highly intrigued by this read, which has been re-released in honor of its 10th anniversary. The Price of Motherhood : Why the Most Important Job in the World Is Still the Least Valued struck a chord for me. However, I'd have to say that it strikes an emotional chord for me and not so much a fiscal one. This book is all about the numbers, which is something that I didn't really expect when I opened the covers and took a peek inside. Being that ten years ago I was not even married, let alone the mother of three children, I didn't ever notice this book before. Even if I had seen it, it would have been of little interest. That said, being that I am now married, have three children and work inside the home, this book had great interest. I delved in. Then, I forced myself through it. 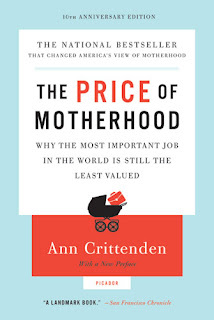 The premise of Ann Crittenden's book is that the services that mothers provide in their homes is undervalued and is not properly compensated for, financially speaking. Her argument is that the government and men in society should realize how much a woman sacrifices by leaving the workforce in order to raise the next generation. By leaving the work force, Crittenden argues that the woman unnecessarily has to give up social security benefits, the comfort of a 401K plan, not to mention a somewhat hefty salary (particularly if she is a bright woman with a promising future in the company!) Crittendon spends the book arguing for the financial rights of women period, but particularly in cases of what she seemed to determine was an inevitable divorce. Now. I have to be honest and tell you that every time I set the book aside I thought to myself, "My word, this woman sounds bitter!" The entire book I was thinking that the only way to give Crittenden what she wants is to increase taxes somewhere to pay for the benefits she wants to give to women who are not in the "visible" workforce but who are staying at home providing childcare, etc. I was figuring that in order to satisfy her desire to enable women to re-enter the workforce as soon as possible, there would have to be government provision of daycare and we'd essentially have to fight against the concept of covenant marriage in favor of something "equal." We'd be promoting a system in which both partners are being constantly made wary of how their spouse would affect their own personal financial interests and investments. I reached the conclusion of the book and discovered that these are things that Crittenden listed as must-haves if we're ever to change the tide and liberate and empower women and make them financially stable in any type of storm that they might be forced to weather. I think you can pretty much assume that I disagree with her "solutions" to the problem. But there is almost no arguing at all with this book because it is written from a different worldview than my own and that's pretty much the crux of the matter. We, as a society, place very little value on the stay-at-home mom. Mothers are at work 24/7, 365 days out of the year. There are few "off" moments of downtime. Mothers are generally not compensated (financially) for their work. Personally though, I would approach the above three situations from a Biblical worldview in which I do believe that a woman is called to be a life-giver and the nurturer of her family. On the flip-side of that, I believe a man is called to support and provide for his family as best as he possibly can. Yes, I do have a very traditional view of the family - wherein the man is the bread winner and the woman cares for the home. That model is largely broken in today's society though and so I saw the point and purpose of this book as being somewhat valid in that it's a desperate solution trying to fix a desperate problem. I guess what I'm trying to say is - the arguments in The Price of Motherhood make sense. I read and clearly understood her points. The way that society loosely holds on to the concept of what marriage is calls for each spouse to protect themselves and their interests. Shouts of equality under the present day circumstances are easy to comprehend. So long as we oppose traditional marriage then attacking any aspect of it - and trying to protects the partnership aspects of it that we most like or care for (on any given day) - should be expected. That said, I couldn't help reading this book and being rather put off by it because it's a modern day solution to a deep-rooted problem. If we put value on the marriage covenant then the problems and negative emotions describe and expressed in this book would decrease. Families would remain united and partnerships intact. Children wouldn't be viewed as another commodity or "problem" to be dealt with as a result of a marital union, but would instead be viewed as blessings. At no point in this book did I ever feel as if Crittenden felt that children were a blessing. They were something that women wanted, usually, and never the men. (If you were to believe what she wrote, that is.) At one point she talked about the man's right to procreate but she never gave an example of a father who longed for and valued his offspring. Most of the examples she cited, if not all, showed a callous and distant father who saw his wife as free labor. That's a very sad state of affairs, folks. Because if we do not value our help-meet and partner then what hope have the children? Children are indeed a blessing and a gift from the Lord. One of the best ways of showing children that you care for and value them, is to value your marriage and love/respect your spouse. Is staying at home with the children always fun? I dare say that it is not always just a barrel full of monkeys. (Or, perhaps, it is?) It's hard work, make no mistake about it. Having children changes everything in life. But are they worth it? Oh absolutely. Honest and true: no job or pay could ever equal the overall joy and delight of being able to stay home and be a life giver and a nurturer. Fulfilling this role is fulfillment in and of itself. Especially when blessed with a spouse who feels as you do and has made a lifetime covenant before God to honor the wedding vows and walk this journey as a team. I could go on (and on and on) but I'll stop here. Was this book interesting and enlightening? Most definitely. Would I recommend it? Of course! It's a curious read and full of information that would prompt a decent conversation. I like these types of reads very much - whether or not I would agree with them. In this case I do not but that doesn't make me regret the read. Instead, I'm more glad to have read it to understand the arguments behind what Crittenden is trying to persuade people of. Great review...sharing Crittenden's points while offering your own worldview. It does sound like a book to make a person consider what they really think and value for a family. Interesting! So thought-provoking to read your review of this. Amazing, the complications our "enlightened" society introduces to life. "Is staying at home with the children always fun? I dare say that it is not always just a barrel full of monkeys. (Or, perhaps, it is?)" I read this book when it came out 10 years ago and really enjoyed your review. I thought her book was unnecessarily focused on women- I worked with several women who had stay-at-home husbands and it's at LEAST as hard to be a stay-at-home dad as it is to be a stay-at-home mom. Stay-at-home dads experience more discrimination if they return to the workforce and are not welcomed into the social circles of stay-at-home moms. I find the economics fascinating because our society heavily relies on the taxes of second income earners to fund roads, prisons, public schools, Medicaid and social security. Much of what government provides would be unavailable if most families had only a single wage earner after marriage. It's interesting to me how Japan and Italy, which have birthrates of around one child per woman, do little to support women with children and a job so many women don't have children or have only one. France and Scandinavia, on the other hand, are supportive of women with children (Scandinavian women are entitled to work part-time rather than full-time until their youngest child is 8, for example) and have replacement level birthrates. In the US, the decline in employer-provided family medical coverage is a huge economic issue. More employers (like Amazon) don't subsidize family medical insurance and $1000/month is a great deal for a working or middle class family, especially because most of that is after-tax. This will be an even greater problem for large families if more employers drop coverage because private coverage is likely to be per-child and not per-family. While I think a lot of Ann's data is fascinating and would use it to remind any stay-at-home-parent of their economic contribution, she is a liberal who believes the federal government should tax earners to make it possible to subsidize those who stay at home. (In essence, we do this anyway because two-income families typically pay more taxes than single-earner households.) I have to fundamentally disagree with this approach because it limits the freedom of families to choose who will and will not work and keep the house and care for the children. I would hesitate to say the idea of dad providing financial provision and mom staying home with the kids is a biblical worldview. I don't actually see any examples of that in scripture. Patriarchal nomadic cultures had divisions of labor but it wasn't that clear-cut. Women tending the house and children is not really mentioned in the N.T. much; you have little mention of them at all and when you do, you have Priscilla working with her husband in their business, Lydia, a seller of purple, and a prostitute named Mary. I've picked this book up on and off since it was published, but never read it. Thanks for your in depth thoughts. Taia - Interesting comment. I'm definitely a conservative in my approach to taxes and think a lot of things are provided by the government that should not be. But it's interesting to consider and think about in relation to roles in society. Rachelle - This is a purposed focus of mine this year in particular. As I said, I have a very "old-fashioned" view of this and do believe there are solid Biblical arguments for the roles played by women and men and I don't believe that they are the same. Complimentary - YES! The same and interchangeable? No. I have not read this book but since you and I have a similar world view I'm sure my thoughts would fall along the same lines. I don't want a government handout for staying home to care for my family. Nor do I want the taxes we pay from my husband's income to be used for state-run daycares. If you are looking at the situation strictly financially, then the arguments you gave from her do make sense. But the reasons I stay home with my children aren't financial (although the daycare costs for 4 children would be astronomical), they are intangible. I'll stop there before I really get going on my soapbox. Being a mom is about sacrificing my wants in order to develop stable, healthy children. THEY are my greatest asset and comfort - not a bank account or 401k. I feel sure that I've read this book--but I'm not finding it in my catalogue of all I've read since Sept 5, 2006. So I probably read it more than 5 years ago? A similar book that I enjoyed reading was Elizabeth Warren and Amelia Warren Tyagi's The Two Income Trap. 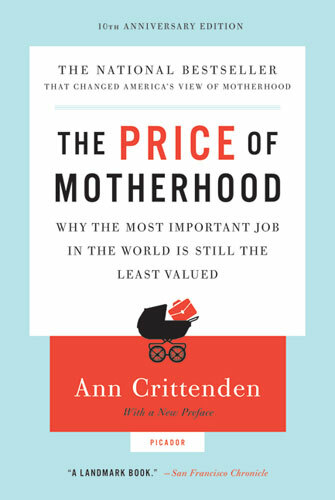 Like Crittenden's book, it focuses on the economics of family arrangements (for lack of a better way to describe it)--but while Crittenden complains about the burden of mothering and begs for government solutions, these authors look at bankruptcy data and develop an argument that dual-income households actually contribute to the financial INstability of a family. Anyway, I found it interesting.